Sorry, we're unable to register you. A PURCHASE WILL NOT INCREASE CHANCES OF WINNING. DESCRIPTION: The Universal Studios Hollywood (“USH”) Annual Pass/Season Pass/California Neighbor Pass A Dog’s Journey Movie Premiere Sweepstakes (“Sweepstakes”) begins at 2:00p.m. Pacific Time (“PT”) on April 8, 2019 and ends at 11:00 a.m. PT on April 26, 2019 (“Sweepstakes Period”). For all purposes of this Sweepstakes, the Website’s (defined below) computer is the official clock and all times refer to Pacific Time. ELIGIBILITY: The Sweepstakes is only open to permanent legal residents of the state of California and are active Universal Studios Hollywood Annual Pass/Season Pass/California Neighbor Pass members (“Passholders”) who are eighteen (18) years or older as of 2:00 p.m. PT on April 8, 2019. A purchase or payment of any kind will not increase your chances of winning. Officers, directors, and employees of the Sweepstakes Entities (as defined below), members of these persons’ immediate families (spouses and/or parents, children, and siblings, and their spouses, regardless of where they reside), and/or persons living in the same households as such persons (whether or not related thereto) are ineligible to enter or win the Sweepstakes. Any Annual Pass/Season Pass/California Neighbor Pass members who have won a sweepstakes within the last 90 days will be ineligible to enter this Sweepstakes. The Sweepstakes Entities, as referenced herein, shall include USH (“Sponsor”), 100 Universal City Plaza, Universal City, CA 91608, NBCUniversal Media, LLC (“Prize Provider”), 30 Rockefeller Plaza, New York, NY 10112, and each of their respective parent, subsidiary, and affiliate companies, their administrative, advertising, and promotion agencies, and any other person or entity involved in the development, administration, promotion, or implementation of the Sweepstakes. WINNER SELECTION AND NOTIFICATION: On or about April 26, 2019, One (1) winner (as defined below) will be selected in a random drawing by employees or representatives of Sponsor from among all eligible Entries received during the entire Sweepstakes Period (the “Winners”, each a “Winner”). Sponsor will make two (2) attempts within a forty-eight (48) hour period to notify the potential Winner at the phone number or email address(es) submitted at the time of Entry. Each Potential Winner (or his/her parent or legal guardian (if applicable) may be required to execute and return (via shipping service pre-paid by Sponsor) an Affidavit of Eligibility, Liability Release, Publicity Release (where legal) and any other documentation that Sponsor may require (collectively, “Sweepstakes Documents”) within five (5) days after receipt of those documents by a potential Winner, or such potential Winner may be disqualified and an alternate potential Winner may be selected in a random drawing from among the remaining eligible Entries at Sponsor’s sole discretion. By returning the completed Sweepstakes Documents, each potential Winner attests to the authenticity of his/her Entry. If a potential Winner cannot be reached, if he/she is found to be ineligible, if he/she cannot or does not comply with these Official Rules, and/or if his/her prize notification is returned as undeliverable, such potential Winner will be disqualified and, time permitting, an alternate potential Winner may be selected in a random drawing from among the remaining eligible Entries at Sponsor’s sole discretion. Sweepstakes Documents will be shipped to an address within the Geographic Area only. PRIZES: There will be one (1) prize awarded to one (1) winner, the prize consisting of the following: Two (2) tickets to the movie premiere of A Dog’s Journey– in Los Angeles on May 9, 2019 (the “Event”) (the “Prize”)WINNER MUST BE 18 YEARS OF AGE OR OLDER AND MUST BE ABLE TO ATTEND THE EVENT ON MAY 9, 2019 AT 7:30PM, OR ON OTHER DATES AND TIMES AS DETERMINED BY PRIZE PROVIDER IN ITS SOLE DISCRETION, OR WINNER WILL BE DISQUALIFIED AND AN ALTERNATE WINNER MAY BE SELECTED FROM THE REMAINING ELIGIBLE ENTRIES. Date and time of Event is subject to change. Event may be cancelled. Winner and Guest must attend Event together on the date listed above. The Estimated Retail Value (“ERV”) of the Prize is ($0.00). Actual Retail Value (“ARV”) of Prize may vary. Any differences between stated ERV and ARV of Prize will not be awarded. This Prize is not transferable and cannot be redeemed for cash. Restrictions, conditions and limitations may apply. The Winner will not receive difference between actual and approximate retail value. Any unclaimed and unused portion of the Prize will be forfeited and will not be substituted, nor will there be any refund for any unclaimed and/or unused portion of the Prize and/or the Prizes. The Winner and Guest will be solely responsible for any and all expenses and incidental travel costs not expressly stated in the trip description and/or prize description herein, including but not limited to any and all hotel or lodging accommodations, hotel, resort or property fees, ground transportation, gasoline, tolls, parking, meals and beverages, travel upgrades, baggage fees, personal incidentals, taxes and gratuities. RELEASE: By entering the Sweepstakes, each entrant agrees for entrant and for entrant’s heirs, executors, and administrators: (a) to indemnify, release and hold harmless Sweepstakes Entities, and each of their respective parent, subsidiary, affiliated and related companies, their successors and assigns, and their respective officers, directors, agents and employees (collectively, “Released Parties”) from any liability, illness, injury, death, loss, litigation, or damage that may occur, directly or indirectly, whether caused by negligence or not, from such entrant’s participation in the Sweepstakes and/or his/her acceptance, possession, use, or misuse of Prize or any portion thereof (including any travel related thereto); (b) to indemnify, defend and hold harmless the Released Parties from any and all liability resulting or arising from the Sweepstakes and to hereby acknowledge that the Released Parties have neither made nor are in any manner responsible or liable for any warranty, representation, or guarantee, express or implied, in fact or in law, relative to Prize, including express warranties provided exclusively by Prize supplier that are sent along with Prize; (c) if selected as a Winner, to the posting of such entrant’s name on http://www.universalstudioshollywood.com/sweeps_2019ADogsJourneypremiere and the use by Released Parties of such name, voice, image, and/or likeness for publicity, promotional, and advertising purposes in and all media now or hereafter known, throughout the world in perpetuity, without additional compensation, notification, permission, or approval, and, upon request, to the giving of consent, in writing, to such use; and (d) to be bound by these Official Rules, which are a contract, and to waive any right to claim any ambiguity or error therein or in the Sweepstakes itself, and to be bound by all decisions of Sponsor, whose decisions are binding and final. Failure to comply with the conditions listed herein may result in disqualification from the Sweepstakes. ADDITIONAL TERMS: Sponsor reserve the right to terminate the Sweepstakes or permanently disqualify from any promotion any person they believe has intentionally violated these Official Rules. Any attempt to deliberately damage the Sweepstakes or operation thereof is unlawful and subject to legal action by Sponsor, who may seek damages to the fullest extent permitted by law. Sponsor reserves the right to cancel, suspend, or modify the Sweepstakes should any computer virus, malfunction, or other cause beyond their control corrupt the administration, security, or proper operation thereof. In the event of such cancellation, suspension, or modification, Prizes may be awarded in a random drawing from among all eligible, non-suspect Entries received prior to the event requiring cancellation, suspension, or modification. Notice of cancellation, suspension, or modification will be posted on the Website. The failure of Sponsor to comply with any provision of these Official Rules due to an act of God, hurricane, war, fire, riot, earthquake, terrorism, act of public enemies, actions of governmental authorities (excepting compliance with applicable codes and regulations), or other “force majeure” event will not be considered a breach of these Official Rules. Released Parties assume no responsibility for any injury or damage to entrants’ or to any other person’s computer and/or telephone relating to or resulting from entering or downloading materials or software in connection with the Sweepstakes. Released Parties are not responsible for telecommunications, network, electronic, technical, mobile telephone service, or computer failures of any kind; for inaccurate transcription of Entry Information; for errors in any promotional, marketing, or prize notification or fulfillment materials or in these Official Rules; for any human or electronic error; or for Entries that are stolen, misdirected, garbled, delayed, lost, late, damaged, or returned. Sponsor may prohibit any entrant or potential entrant from participating in the Sweepstakes, if such entrant or potential entrant Parks a disregard for these Official Rules; acts with an intent to annoy, abuse, threaten, or harass any other entrant, Sponsor, or Sponsor’s agents or representatives; or behaves in any other disruptive manner (as determined by Sponsor in its sole discretion). DISPUTES: The Sweepstakes is governed by, and will be construed in accordance with, the laws of the State of California, excluding its conflicts of law rules, and the forum and venue for any dispute shall be in Los Angeles, California. Any dispute, controversy or claim arising from or relating to the Sweepstakes shall be resolved by final and binding arbitration administered by JAMS in accordance with its Streamlined Arbitration Rules and Procedures or subsequent versions thereof (“JAMS Rules”). The JAMS Rules for selection of an arbitrator shall be followed, except that the arbitrator shall be experienced and licensed to practice law in Los Angeles, California. All proceedings brought pursuant to this paragraph will be conducted in the County of Los Angeles, California. THE REMEDY FOR ANY CLAIM SHALL BE LIMITED TO ACTUAL DAMAGES, AND IN NO EVENT SHALL ANY PARTY BE ENTITLED TO RECOVER INDIRECT, PUNITIVE, EXEMPLARY, CONSEQUENTIAL, OR INCIDENTAL DAMAGES, INCLUDING ATTORNEY’S FEES OR OTHER SUCH RELATED COSTS OF BRINGING A CLAIM, OR TO SEEK INJUNCTIVE OR ANY OTHER EQUITABLE RELIEF. ANY AND ALL DISPUTES, CLAIMS AND CAUSES OF ACTION ARISING OUT OF OR RELATING TO THE SWEEPSTAKES, OR ANY PRIZE AWARDED, MUST BE RESOLVED INDIVIDUALLY, WITHOUT RESORT TO ANY FORM OF CLASS ACTION OR CLASS ARBITRATION. ENTRANT WAIVES ANY RIGHT TO BRING CLAIMS AS A REPRESENTATIVE OR AS A MEMBER OF A CLASS OR IN A PRIVATE ATTORNEY GENERAL CAPACITY. RULES/WINNERS LIST: For the names of the Winners, or for an additional copy of these Official Rules, send a self-addressed, stamped envelope no later than June 1, 2019 to: Universal Studios Hollywood A Dog’s Journey Movie Premiere Sweepstakes, 100 Universal City Plaza; Bldg. 4505/2nd Floor, Universal City, CA 91608 Attn: USH Annual Pass/Season Pass Program. 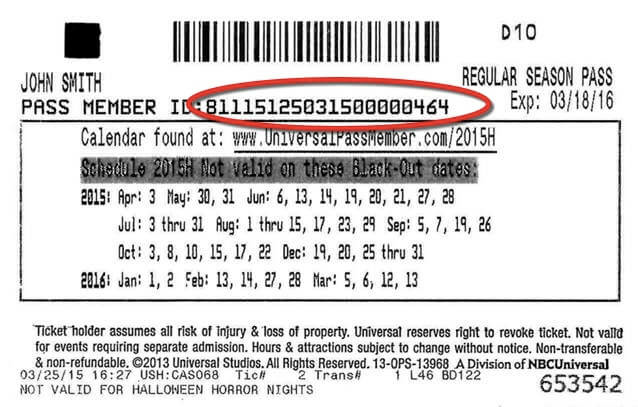 SPONSOR: Universal City Studios LLC dba Universal Studios Hollywood (“USH”), Universal City, CA 91608. ©2019 Universal Studios. Participants may copy these Official Rules for personal use only and not for any commercial purpose whatsoever. All rights reserved. No purchase necessary. Legal residents of California, age 18+ only. One (1) entry per person. Sweepstakes ends 4/26/19 at 11:00am Pacific Time. For Official Sweepstakes Rules click here. All capitalized terms are as defined in the Official Sweepstakes Rules. Prize includes Two (2) tickets for the premiere of A Dog’s Journey, May 9, 2019. Transportation not included. Thank you. Your entry has been received.